In 1927, Henry Ford said: "Mark my words. A combination airplane and motor car is coming. You may smile, but it will come." Talk about a futurist! He was right on, off by about 90 years, but the time is now. 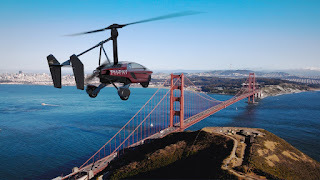 This is a second hot prototype flying car we wanted to focus on. It's the creation of the Netherlands based company PAL-V. Called The Liberty, the developers claim it's production ready, making it a global first. And they say it's "Licensed to Thrill". As you can see in the artist's rendering, the Liberty has a design that's different from other flying car prototypes. It looks like a helicopter. And, in fact, there's a center mounted rotor blade on top. The big deal is that it's production ready. All it awaits is full certification, which it expects in 2019. The company says it will start delivering vehicles shortly thereafter. On the road, it can drive up to 100 mph and accelerate from 0 to 62 mph in under 9 seconds. The car component has a 100 hp engine. The aircraft component has a 200 hp engine with top speed of 120 mph and a range of 310 miles or 4.3 hours. Maximum altitude is 11,500 feet. It's a 2-seater The Dutch have priced it at $599,000 for the top of the line model and $399,000 for a sports vehicle model. The Liberty and the AeroMobile 4.0 are cited by a number of industry watchers as the first two flying cars to enter the airspace and hiways commercially. No question, Henry Ford would be one of the first driver-pilots of a flying car.